Going about our daily business, I see a lot of historical stained glass windows in a lot of churches, chapels and places of worship. Some of these we are privileged to be able to work on in a restorative/conservation capacity, many I simply take a moment or two to view and appreciate. Though it’s possible to take a degree of artistic inspiration away from most (with perhaps the exception of anything produced in the 1970’s), there are a few I would consider as favourites; a list that over time continues to grow. 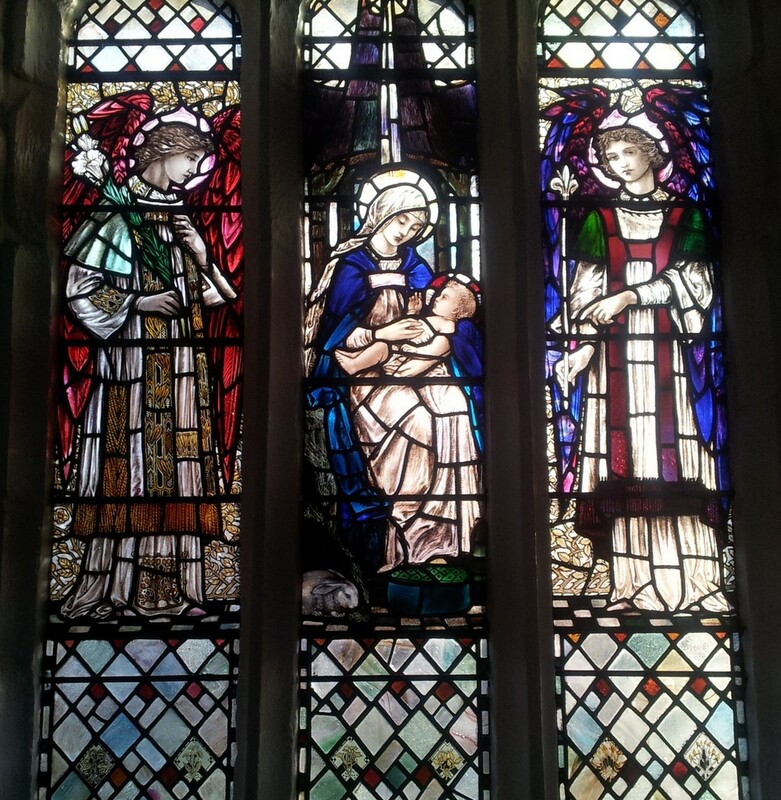 One such window is The Virgin and Child by Christopher Whitworth Whall, to be found at St. Mary and All Saints Church, Whalley. Of very modest proportions, the window comprises three lights without tracery and depicts the Virgin Mary and Child within the central light, flanked by an Angel in each of the two outer lights. A rabbit sits at the feet of Mary. The figurative section takes up approximately half of the surface area with a simple diamond leaded matrix enclosing it above and below. The window was produced exclusively in English “Slab” glass, historically a favourite of Whall for it’s intrinsically “glassy” quality. Situated within the naves south side, this window takes full advantage of it’s south facing position with direct sun-light (on those rare occasions the sun actually shines) throughout the entire day. It is this light and it’s effect as it pours through the “slab” glass that initially draws the eye to it. Whall’s approach to his work was to allow his glass to retain the appearance of glass, achieved primarily by not over-layering it with paint and also by including, as with this example in the diamond sections, areas with little or no paint at all. This appreciation for the base material, and control of paint layering is, for me, what marks this window out as something special, giving it a jewel like quality with a depth of richness in tone and colour lacking in so many. As testament to this, adjacent to it is a William Morris window which, while beautifully produced, appears somehow flat in comparison. Then there is the beautifully understated way in which the pictorial aspect has been drawn; economic use of delicate trace lines and sparing use of shading layers that produced figures clearly reflecting Whall’s strong influence by, and on, the Arts and Crafts Movement, itself heavily influenced by the Pre-Raphaelite Brotherhood. 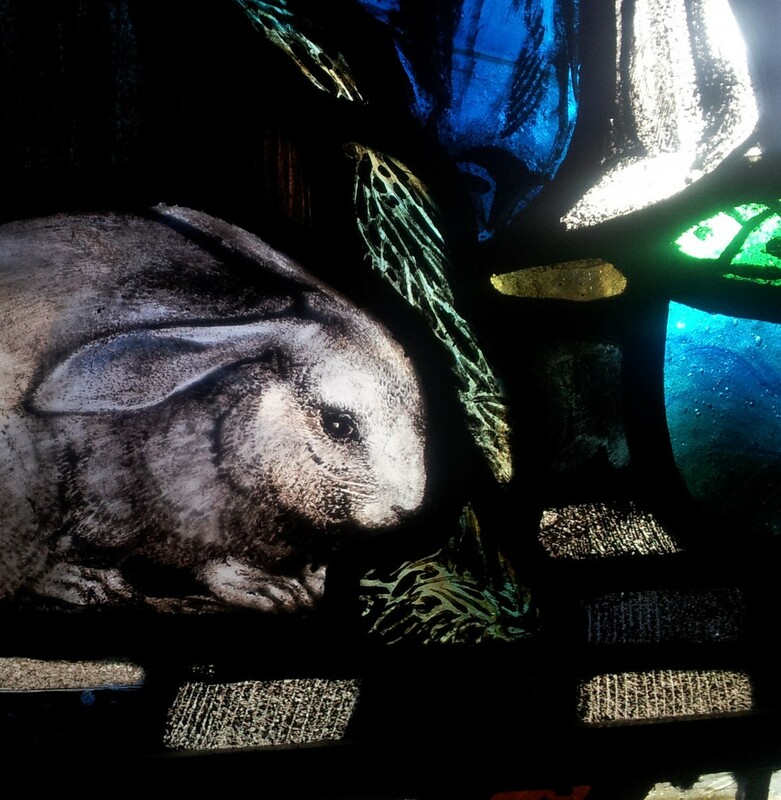 Take a few minutes to study the rabbit at Mary’s feet; amongst my favourite pieces of glass in any window I have yet seen, and here you have a perfect example of Whall’s mastery of the brush and its craft. Christopher Whall’s working life is fairly well documented. 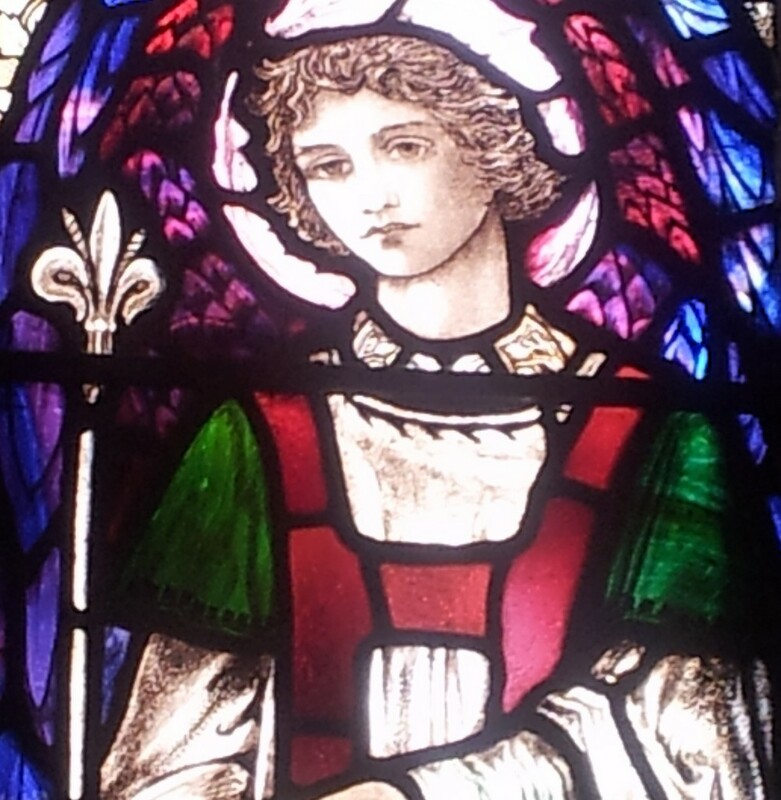 Highly regarded during his life-time as eminent within his field and one of the greatest practitioners of arts and crafts stained glass, he turned down the offer of a Knighthood, believing it to be incompatible with the lifestyle of a practicing craftsman. I find it to be a true mark of Whall as an artist and craftsman that that modesty clearly shines through his work over 100 years after it was completed and installed.